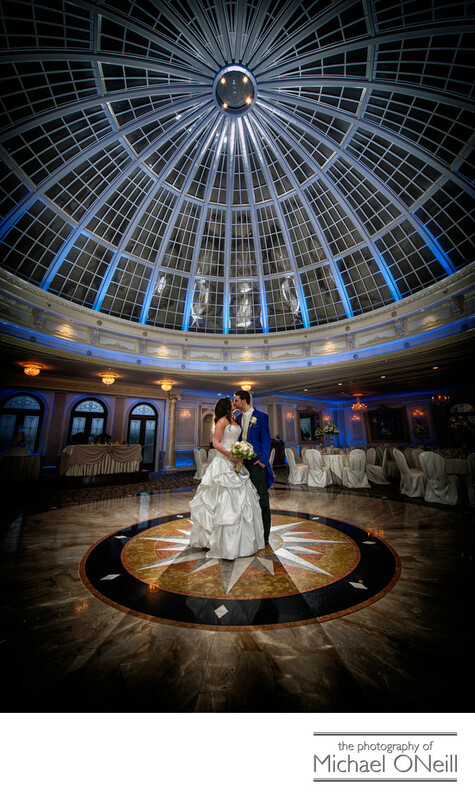 This dramatic wedding photo was taken in the Dome Room at Jericho Terrace in Mineola, New York; one of Long Island’s most popular wedding catering venues. This wonderful wedding ceremony and reception venue offers some of the most elegant, yet contemporary backgrounds for exquisite wedding pictures. As you peruse this web site you will find many stunning wedding images created at Jericho Terrace as I’ve had the experience of working here many times in my career as a Long Island Wedding and Portrait photographer. This image was created just before the wedding couple’s dinner reception began. I brought the bride and groom into the dome room before the guests were invited in and positioned them in the center of the dance floor which features a beautiful inlay directly beneath the dome. The blue uplighting complimented the groom’s blue tuxedo and blue light was projected up into the dome. The color of the lighting in the dome can be changed to coordinate with your choice of linens, flowers and decorations which define your style. If you are planning a Jericho Terrace wedding celebration you owe it to yourself to contact me at my East Northport, New York wedding photography studio and gallery. I would love to sit down with you to discuss all of your plans and wishes for your big day.